Located in close proximity to Sundance Square, the Tarrant County Convention Center, premium hotels and the Bass Performance Hall, and within two blocks of the western hub for the Trinity Railway Express. Located on Commerce Street between 6th and 7th Streets – offering monthly and visitor Valet parking, as well as monthly self-park. Enter the garage from the North bound lane of Commerce Street only. Located on Commerce Street between 5th and 6th Streets – unreserved self-park, monthly contract and visitor parking. Enter the garage from the West by using 5th Street, or from the East by using 6th Street (Spur 280 coming into downtown). Located on 6th Street between Main and Houston Streets – offering monthly contract and visitor parking. Enter the garage from the West only, using 6th Street. After-hour Valet service is available to those employees who park in the above garages. Any employee who wishes to move their car into the Valet Garage after 5:00 p.m. (Monday through Friday) may do so at no charge. Individuals must identify themselves as customers of 777 Main. This service is intended for the safety of those people who work late hours and would like to move their cars closer to the building. Though especially appealing during the winter months, this service is offered year around. 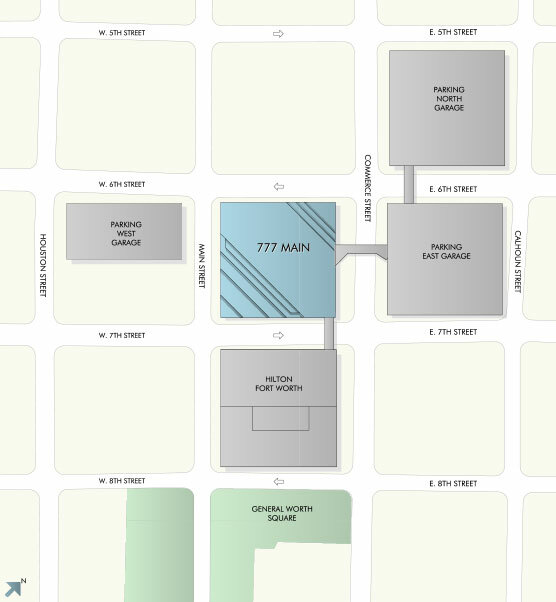 The garages are operated for the convenience of customers in 777 Main. Spaces are allocated by lease. Each lease is granted a particular number of parking spaces by the Landlord. Month-to-month parking may be granted based on availability. Visitors will be issued tickets at the Valet entrance and charged by the hour. Visitor parking fees will be paid at the Cashier's booth. Customers may set-up a validation account by calling Lanier Parking at 817/334-7967. The garages are solely for the purpose of parking. Exercising in the garages is discouraged. Landlord is not responsible for theft, loss or damage to vehicles or their contents. Parking is the responsibility of the customer. Doors should be locked and items inside should be kept out of sight. Close adherence must be made to parking spaces as assigned. Please note that certain spaces are designed for small or compact cars only. Habitual violators are subject to having parking privileges revoked.